There has been one hell of a lot of anticipation for EMPEROR/PECCATUM legend Ihsahn's solo album debut, "The Adversary", and rightly so. Terms like "genius" have surrounded his projects, which could have resulted in "The Adversary" being a huge disappointment. Even I was wondering how let down I'd be by the final product. No problem here, folks. "The Adversary" combines intelligent (but not pretentious or verbose) songwriting with an approach that is metal to the bone. Though there is clearly a bent toward the black metal end of the spectrum, the following often-quoted statement from Ihsahn is not only accurate, but describes an album that ably mixes influences without sounding disjointed: "It incorporates influential elements from all periods/stages of my background since I first picked up the guitar 20 years ago; powerful, epic, extreme and straight from the heart." Ihsahn plays all the instruments, except for drums, which are performed by Asgeir Mickelson (BORKNAGAR, SPIRAL ARCHITECT). As mentioned above, the album's heaviest moments (and there are far fewer mellow ones) are rooted in speedy black metal licks, the actual arrangements unsurprisingly giving off at least a faint EMPEROR feel, certainly in terms of classiness and grand design. "Invocation", "Citizen", "Panem Et Circenses", and "Will You Love Me Now?" are representative of the aforementioned feel, though none are nearly as experimental as the work of latter-day EMPEROR. Breaks for lighter moments, whether driven by a lightly picked guitar or classically inspired synth line, serve to break up the aggressive moments. Vocals that are often gruff, sometimes croaky, are spiced up with Ihsahn's falsetto flourishes. In addition to better enunciation, the vocals are mixed higher than was the case with EMPEROR. Here again though, while black metal at its base, this is by no means a continuation of his former band's work. It would seem impossible not to hear at least bits of his work from that period, as well as from the PECCATUM years. While retaining black metal elements (for the most part), the remaining songs offer a mix of traditional heavy metal and proggy slivers, colored with melancholia and ethereal atmospheres. "Called by the Fire" is an album highlight, sporting a riff derived from the MERCYFUL FATE school and a wonderfully catchy chorus. 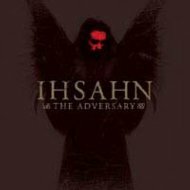 Ihsahn even sounds a good deal like KING DIAMOND when he hits the extra high notes. A marriage of elegance and brooding heaviness occurs on "Astera Ton Proinon", during which Ihsahn can sound reflective one moment and anguished the next. Quasi-operatic harmonies in parts serve the song nicely. "And He Shall Walk in Empty Places" offers a stronger sense of the melodic to go with some classy black metal picking, as well as a particularly effective break into riff-chunk territory. The album closes with "The Pain is Still Mine", a 10-minute track that is far more epic and PECCATUM-like than the rest of the album. Though a more guitar-oriented approach is apparent on the song's second half, an indefinable sadness is heard throughout. Few albums live up to such intense hype, but "The Adversary" succeeds for three primary reasons: (1) Good songwriting; (2) a natural blend of influences; and (3) an honest delivery. It may not quite hit "genius" heights, but the album is certainly an accomplished and enjoyable affair. An easy 8.5.